Many socks have personalities to me, but this one has a special story I wanted to share. In 2012, we hired a new customer service person named LP, a breast cancer survivor who was in remission and looking to get back into the workplace. She was an enthusiastic, funny, hard-working person and we hit it off immediately. She joined the team and became a treasured member of our band of sock enthusiasts. In 2015, one of her routine scans showed the cancer was back and had spread to her liver. For the second time in her life, she fought cancer with amazing grace and strength, but in 2016 she passed away. LP loved coming to work, even while fighting cancer. She often told me it was her happy place where she got to forget about cancer and just be a part of something fun and amazing. That was such a huge compliment that I have never forgotten. 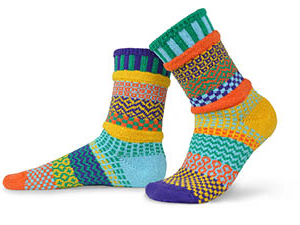 One of her favorite things to do was coordinate and ship all of our Sock of the Month Club shipments. For the two-plus years since her passing, every month when we go to ship all our Sock of the Month shipments, we light a candle to remember her. In 2017, I designed a sock based on some of her favorite colors that her family & friends wore to LP's Celebration of Life on the one year anniversary of her passing. When I designed this pair I had only intended for it to be shared with LP's inner circle, but I loved the colors so much that I decided to share it with the world. When thinking of what to name this sock designed for a friend, Forget-Me-Not was the obvious choice. Longtime fans of ours will be familiar with Dragonheart Vermont, a community of breast cancer survivors that come together to race dragon boats and support one another through their cancer journeys. They are an amazing community of survivors at all stages, from initial diagnosis to celebrating many years cancer-free, and they help people facing a cancer diagnosis realize that there can be a vigorous, exciting, and joyful life after cancer. As part of Breast Cancer Awareness month, every October we are proud to donate a portion of all our sales to Dragonheart Vermont so they can continue to provide a supportive community to breast cancer survivors.